Rumble In The Jumble, London’s number one celebrity jumble sale is set to return bigger and better than ever before on 9th May at Oval Space in East London. 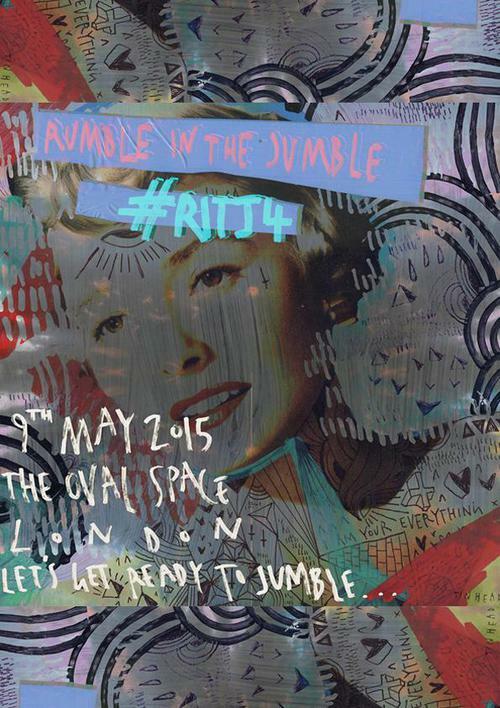 Returning for a fourth year, Rumble In The Jumble is organised by BBC Radio 1’s Gemma Cairney and The Music Circle. Proceeds of this year’s sale will go towards Oxfam’s campaign to establish greater gender equality in Myanmar, Burma. The list of celebrities who have donated personal items for this year’s jumble sale includes: Alexa Chung, Annie Lennox, Andy Bell, Annie Mac, Belle & Sebastian, Beth Ditto, Beth Jeans Houghton, Blood Red Shoes, Bombay Bicycle Club, Caroline Flack, Nicole Scherzinger, Catfish & The Bottlemen, Claudia Winkleman, Daisy Lowe, Daughter, David Gandy, Dawn O Porter & Chris O Dowd, Duke Dumont, Ella Eyre, Enter Shikari, Fearne Cotton, Florence Welch, Foals, Friendly Fires, Jameela Jamil, Jessie Cave, Laura Marling, Lauren Laverne, Lianne La Havas, Mark Ronson, Metronomy, Mumford & Sons, Nick Grimshaw, Paloma Faith, Rudimental, Sali Hughes, Sarah-Jane Crawford, Hot Chip, Alex Jones (The One Show) and Toddla T.
Unique one-off items up for grabs include a suave suit from man of the moment, Mark Ronson, one of Annie Lennox’s delectable handbags, a signed pair of black velvet Aquascutum dancing slippers from Friendly Fires and a dapper David Gandy suit. As well as celebrity donations, Rumble in the Jumble has also received generous shipments of brand new items which will be sold at jumble prices from brands such as AllSaints, ASOS, Beggars Run, Beyond Retro, Found East Vintage, Monki, Regatta, Barbour, Smashbox, Sonos, Ted’s Draws and Whistles. A fantastic haul of music and merch swag has kindly been supplied by Red Light Management, Moshi Moshi and Kristina Records and more. There will also be a print stand that will be selling donated work from Robert Hunter, We Three Club, Bread Collective, Paul Rafferty, Print Club London and Babak Ganjei. Keeping the troops fed this year will be Joe’s Tea Company, Standard Issue who will be hosting a cake stand, Drink, Shop & Do cakes and The Bowler, who will be dishing out gourmet meatballs.